One new thing this time around is that no one is assigned any specific dates to bring food. It's just an open potluck each night, with whoever is willing and able to bring food feeding the rest of the folks. So far, it's worked out surprisingly well (evidently Someone is coordinating it all, but it sure ain't us) and we've eaten a lot of delicious stuff. Here's a photo Dambara took of us in the hatha yoga section of class. Trikonasana, here we come! Our sound crew: the unsung heroes that make it effortless for all of us to hear and appreciate the events in the temple. From left: Bill, Leo, Patrick, Diego, Ron (not shown: Barbara, Lisa). They met in early December to talk shop and enjoy some satsang together. For those who love sitting in the back, you will be pleased to hear that that's often the best sound in the house. If you would enjoy becoming a member of the intrepid sound crew (and enjoying that great sound in the back), talk to anyone sitting at the sound board any Sunday, or to one of the staff. 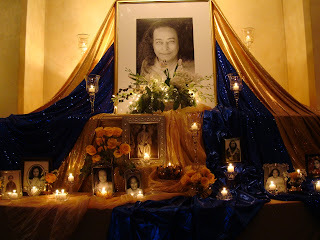 This past Tuesday, January 5, marked the 107th anniversary of Paramhansa Yogananda's birth. We began the evening with a 2-hour meditation at the temple, where a beautiful altar display has been set up all week, with many pictures of Master. On Saturday we had a followup meditation day, continuing to celebrate Master's birthday in the way he liked best. This was similar to the Christmas all-day meditation, but a bit shorter. In each break we sang a couple of chants, then listened to some recordings of Yogananda speaking, and of Nayaswami Kriyananda reading both from Autobiography of a Yogi, and his own autobiography The Path. This gave us a chance to really focus on tuning in to Master, both through his own voice, and through Swamiji's description of what it was like to live with him. 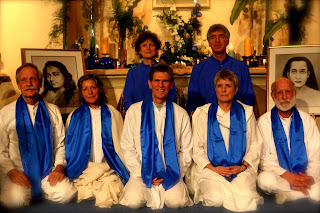 Asha mentioned that the birthday meditation was the seventeenth special event at Ananda since Thanksgiving, and marks the end to the main holiday season. That's a busy couple of months! As we take a breather, though, it's nice to think back to Thanksgiving, and connect that feeling of gratitude to this week's celebrations. It's because our guru had a birthday that we are even here on this spiritual path at all, and that's the biggest blessing we can possibly be thankful for. And so, among our entire spiritual family, we all wish each other a very happy birthday. 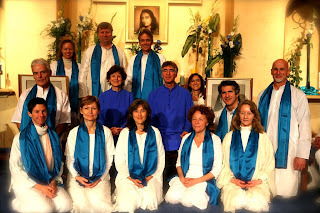 At the New Year's Eve service, Ananda Palo Alto held its first initiation ceremony for members joining the new Nayaswami order that Swami Kriyananda started in Italy last November. There are two lovely sets of photos that you can see, from Jeffrey and from Karen and David. 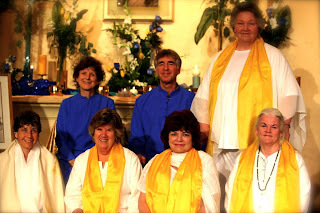 The three levels of this new order are identified by color, which can be worn as a complete set of robes, or as a single, symbolic item of clothing. In the case of this ceremony, the participants wore matching scarves. Here, then, are the new initiates — congratulations to all!